Hello all! I know it has been a bit since my last Antabloc check in. Before I get into nitty gritty, I just want to thank everyone who have visited the logs, shared their experiences with my readers and sent their advice and well wishes. I have been blown away by all your knowledge, love, strength and caring. SO many of you or your loved ones have been struggling with illness, as I have. It has been an amazing experience for me to hear your stories. You all give my readers and I hope. Your experience and advice has helped on this journey. Thank you! So a few things have come up this past few weeks. Off the bat, I noticed a flare up coinciding with the monthly hormonal spike most women get during that time of the month. After having a very bad morning a few weeks ago, I was kind of freaking out. I went online and sure enough, I discovered that female Crohn's patients usually get a mild flare up during that time. HELLO? No one, not one doctor has EVER told me that! And I think because my symptoms have been managed so well since on Anatabloc, that I noticed the flare up more distinctly than the past years where (I realize now) I was barely managing. SO I never noticed things get noticeably worse during that time, until now! So based on some reading and research, I took Evening Primrose supplements that week with the Anatabloc. Within a couple days things went back to happy. I stayed on it throughout that week. Evidently, Evening Primrose is not only a mild anti-inflammatory but it blocks the one hormone that gets elevated during that time that causes inflammation. So that will be part of my "once a month" routine. I hope to pretake it so that when things hit, I'll manage my Crohn's symptoms better. Thank you, Evening Primrose! Things have been ticking along. I have been continuing with 2 Anatabloc 3 times a day. If I overdo it eating out or with a decadent dessert (sugar is usually my trigger) I take an extra lozenge before bed. It seems to keep my symptoms under control. I am taking probiotics as well, and today I began aloe vera juice mixed with no sugar added juice. That seems to make my lower intestines even happier. I am currently on no medication. My rational brain thinks I am crazy, yet my system is regulated. Bathroom visits have been normal and consistent. I am in no pain and have no fevers. Will my doctor believe me? I need to set up an appnt. very soon to check in and let her know what has been going on. They will probably want to run tests to see what's really going on. In case my GI tells me to take a flying leap...wondering if anyone knows a GI that is open to monitoring the use of Anatabloc in the Midwest? My worry is that it's so new, many don't even know about it. OK. That's it! Keep the sharing and comments coming! There are many people interested in Anatabloc, and they are visiting and reading! Many are sick, and many don't have meds that are working for them. 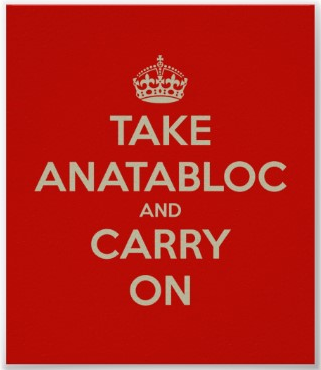 If you have an experience or advice to share with others, please post here or in the Anatabloc logs section of my blog. Your experience may help someone else. It takes a village! Thanks for posting this. I've been reading reviews all over the internet and so many look like absolute gimmicks. I've been taking this supplement for a week now and was getting ready to throw in the towel. I was ready to admit that I was duped out of $80. But after reading your posts... I don't think so anymore. I started taking anatabloc for my lupus - fatigue, joint pain, fevers, ulcers, hairloss, etc. I haven't noticed any relief in the big category hairloss! jk... joint pain. In fact for the past few days my joint pain has been even worse! That was it for me. I really believed that Anatabloc was a hoax, and I was determined to find a legitimate source to confirm my suspicions. 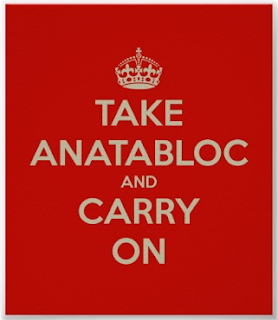 That is what led me here and after reading your posts I totally believe in anatabloc... I suffer from TERRIBLE cramps EVERY time I eat. EVERY. SINGLE. TIME I eat. I have terrible GI issues that leave me with an upset stomach for weeks at a time. But... since starting anatabloc, I have not had any cramps, and very mild stomach irritations. Everything in the bathroom department has improved. I wouldn't say normal, but I will say that it's significantly improved. It's funny that I never even considered that to be part of my complaints! I'm definitely going to finish out the month and see how it goes. Please keep posting updates. I'm so happy you've found relief. Immune suppressants are scary drugs. I've spent a year on them twice and both of those years ended very badly for me. Thank you so much for logging your journey! p.s. another health resource to check out is Dr. Terry Wahls. Doctor and Professor at U of Ia that is healing her MS with nutrition only.